A couple of weeks ago, we went to Rhode Island to check out the city of Newport, well-known for its lovely beaches and of course its mansions. It was holiday in Connecticut, the weather was warm and sunny so we took advantage and took a quick tour to our neighboring state. While there we had a quick stroll of the city center and had a tour of “The Breakers” (Vanderbilt Mansion). We had a truly wonderful time. Even more wonderful to me was the food that we had there. In the evening we had some lobsters at a seafood restaurant and during lunch we had the most amazing sandwich. I couldn’t forget how delicious the sandwich was so I decided to re-create it at home. After all, I already had most of the ingredients. 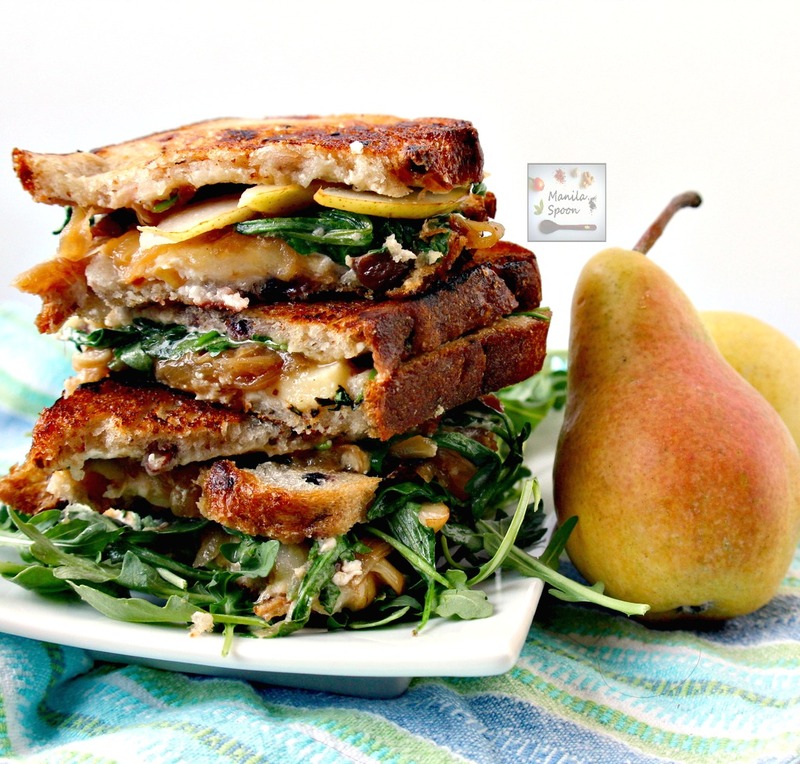 I can honestly say it had become my favorite sandwich and it’s perfect for the season as it uses fresh Pears which at present are all over any grocery or supermarket so it’s certainly a wonderfully delicious fall option. For this particular recipe, there’s no need for any strict measurements for the ingredients so I will simply list them below as a guide. How much you need to use will depend entirely on how many sandwiches you wish to make. 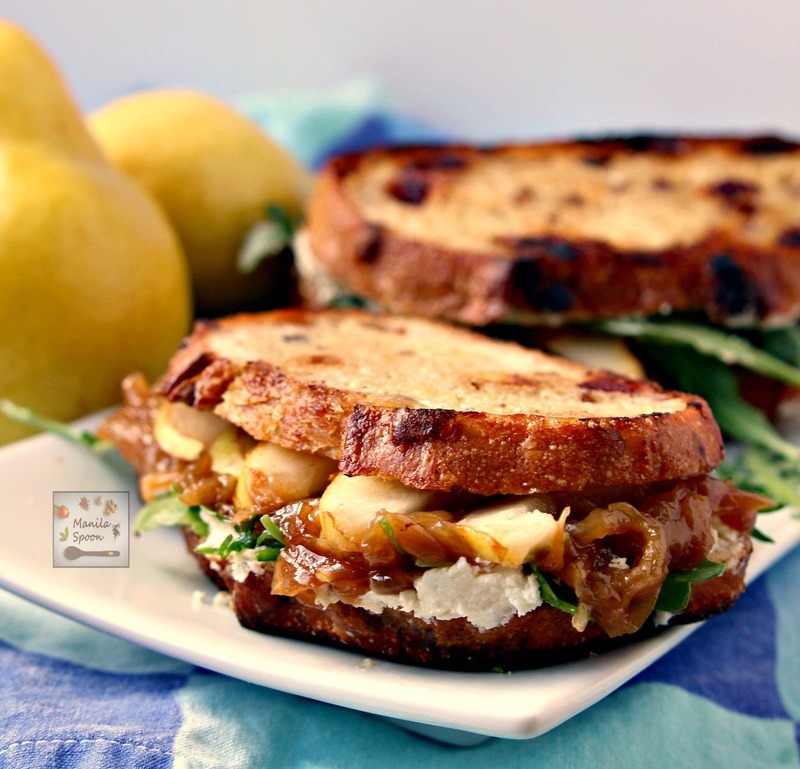 I can imagine that once you’ve tasted it, you’ll probably want to use an entire loaf of your favorite sandwich bread to make these delectable Pear, Honey, Cheese and Caramelized Onion Sandwiches. These sandwiches are pretty easy to make and it’s really just a matter of assembly and the toasting at the end is entirely optional though I would highly recommend it. 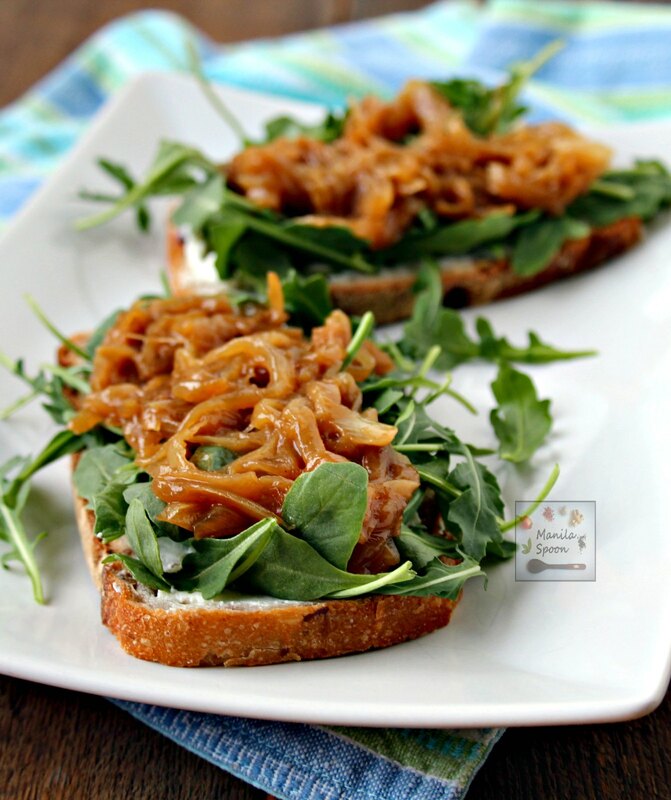 The only thing you need to make, if you wish to do it, as you can certainly buy the jarred one, is the caramelized onion. If you wish to do it yourself, here’s a helpful and easy recipe on how to make it. Here are what you need to make the sandwich. Spread some goat cheese to one side of the sliced bread. I love goat cheese so I spread each slice but it’s up to you. Grab a handful of arugula (baby rockets) and place it on top of the cheese. Thereafter, pile on some caramelized onions. Doesn’t that look yummy already? Fit in as much pear slices as you can! Take the honey and drizzle it over the pears. Top with the other slice of bread and you’re done. But wait, you can up the deliciousness so much more if you butter each slice of bread then toast the sandwich. You can do so in a panini press if you have one or simply use a flat griddle or frying pan. I tell you, this would make the sandwich over the top delish! Below, I simply used a frying pan. All that buttery and crisp deliciousness as a result of a quick toast is worth the extra effort. Hope you try this sandwich while pears are still available. If not, simply try another fruit in season and am sure it would also be yummy! 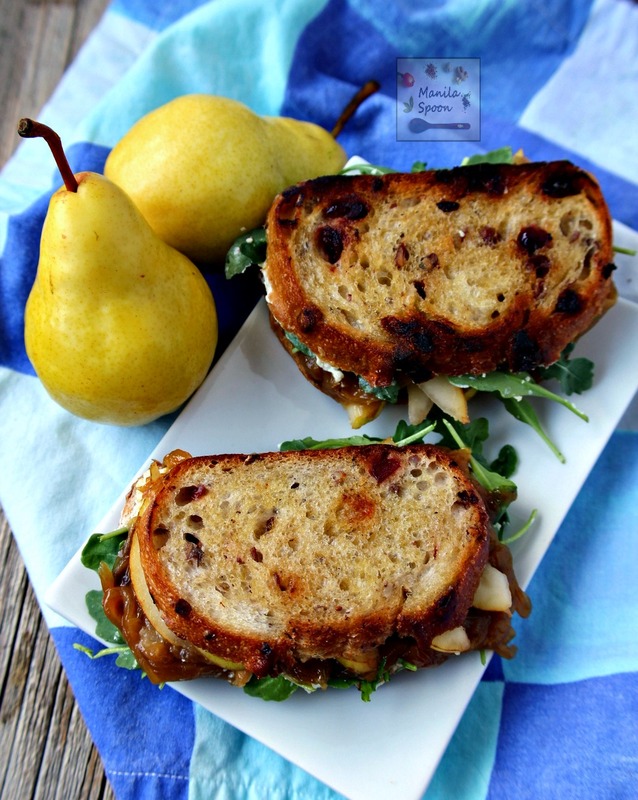 A burst of flavors – fruity sweet, cheesy, herby and buttery yum greet your taste buds with each bite of this delicious Fall sandwich – Pear, Honey, Cheese and Caramelized Onion Sandwiches! Spread some goat cheese on one slice of bread on one side. 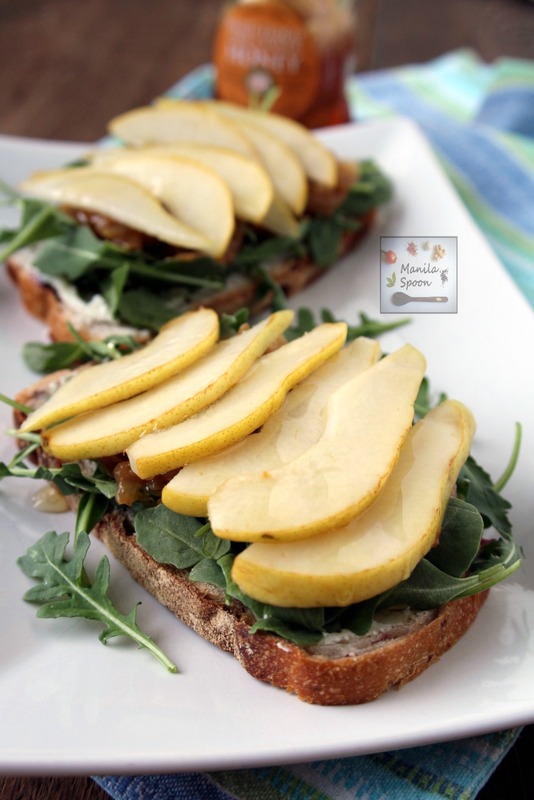 Top the side with the cheese with arugula, caramelized onions, sliced pears then drizzle with honey. Top with the remaining slice. This next step is optional but it sure adds extra flavor so I highly suggest this. Butter the exposed part of the bread on either side. If you have a panini press, heat it then toast the prepared sandwich to your liking. If you don’t have one, simply use a flat griddle or frying pan to toast the bread. Flip and repeat on the other side. Serve warm. I am so jealous that you were just in Newport! That is one of my favorite places to visit – so close to my home. This sandwich looks amazing. I will definitely be making it – and I love the idea of putting it in a panini press. Perfection! I love Newport and has now become one of our favorite destinations! Hope you like the sandwich, thanks! Pear and caramalized onion? YES PLEASE!!! Will have to veganize this but I love the recipe idea and definitely hope to try this someday !!! Anotherr hit from your blog!! Am sure the vegan version would be delish, too! Thanks, Levan! Thanks, Catherine and hope you enjoy it! LOVE Newport, and LOVE this sandwich flavor combo! Looks fabulous! This would be delicious for breakfast too. Love the combo of flavors. Yum! That is true Alison! I can eat this anytime. Thanks! Your pictures are so pretty! This sandwich looks delicious! I would love this for lunch! YUM! 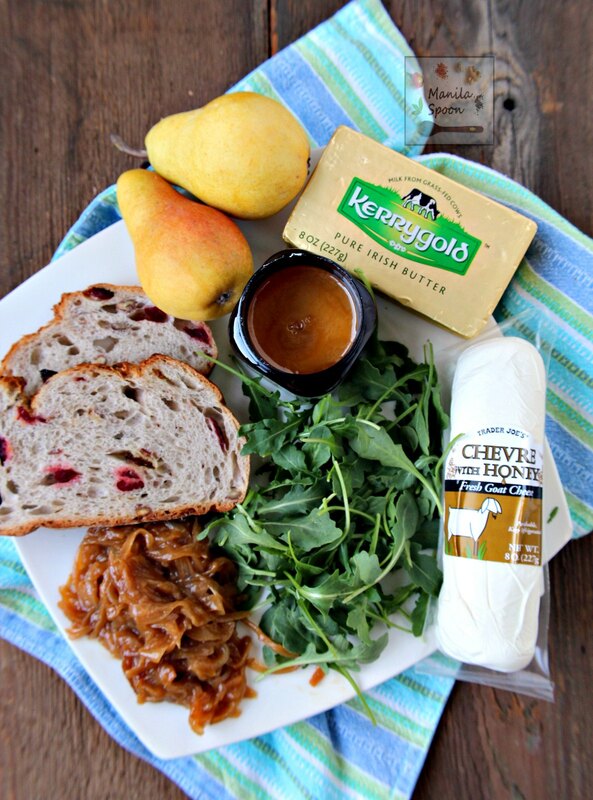 What a fabulous flavor combo, I love cheese and fruit and I will eat caramelized onions anytime. This is so my kind of sandwich; great ingredients I love and looks gorgeous too. Nice job! This has a beautiful look to it…I love how you layer the flavors. This sounds so comforting and just in time for fall! 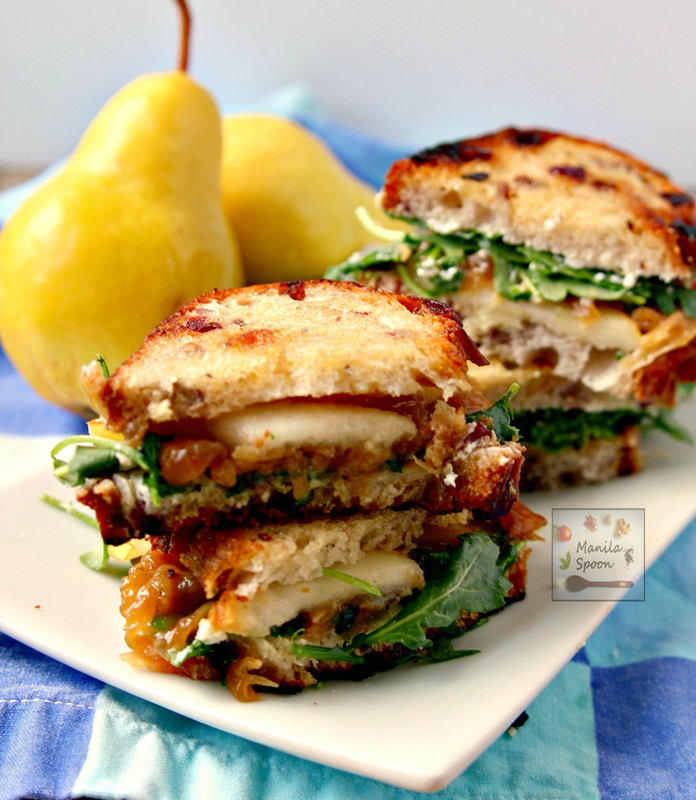 Love that you added pears to the sandwich! This sammy has my name all over it! Lovely! I love sandwiches, and yours looks drool worthy! I wish I could take a bite of my computer screen right now! Yum! Oh Abby…I am drooling over your magnificent sandwich! Beautiful photos and a great post! I love Newport and I love this sandwich. I think it would work great as an app or for brunch too! I have been drooling over this sandwich and I don't even like sandwiches much! SO YUMMY! This has Sunday lunch written all over it! oh my goodness! this looks AHmazing! 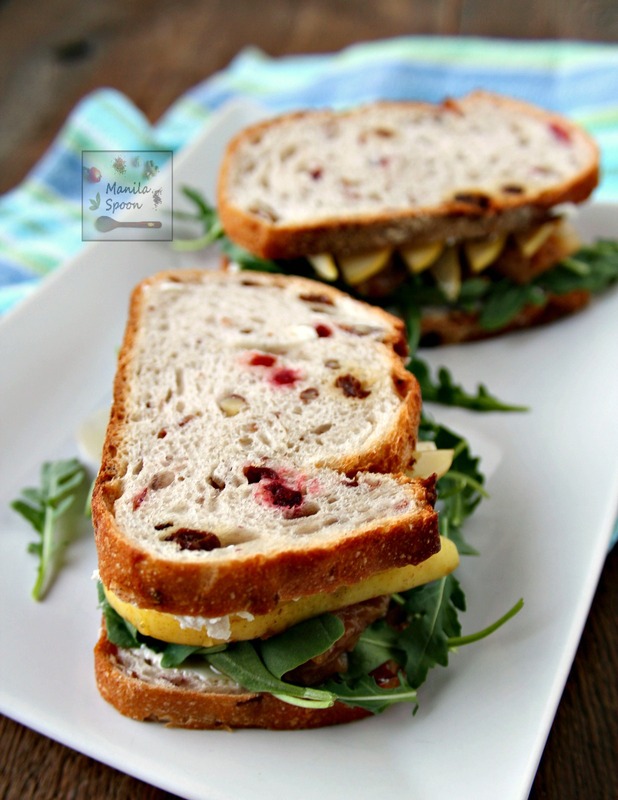 I love the sweet and savory flavors in this sandwich! Pinned and SU! Wow. I love the flavor combinations. You really elevated the sandwich. The cheese choices are great and the toasting on the bread. Yum. Great combination of flavors.. Sandwich looks Yum! Simply drooling over this delicious sandwich! This is just EXACTLY the kind of sandwich i want to eat immediately! What a wonderful sandwich! I love all the layers of flavour!